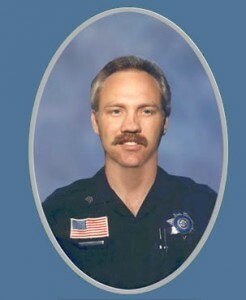 Sergeant Timothy Littlefield was killed while on duty just before 6 p.m., on September 14, 1986. He had been responding to a call for service and had just exited the 1-215 Freeway at 6th Street when his patrol car was struck broadside by a 16-year-old driver who had run the red light at the intersection. Sergeant Littlefield was the fifth San Bernardino police officer to die in the line of duty. Sergeant Littlefield was born in Santa Fe, New Mexico, on May 21, 1949. One of 13 children in a military family, he moved frequently until his father’s military service brought the family to San Bernardino. While growing up in San Bernardino, Sergeant Littlefield attended Aquinas High School and Cal State University, San Bernardino, before enlisting in the U.S. Navy and serving in Vietnam. At the time of his death, Sergeant Littlefield and his wife, Barbara, resided in San Bernardino, where they were raising their five children: Scott, Daniel, Joseph, Thomas and Sandra. Sergeant Littlefield began his law enforcement career as an evidence technician with the San Bernardino County Sheriff’s Department before joining the San Bernardino Police Department as a police assistant in 1975. He joined the Reserve Unit in 1976 and was then hired full time by the department, where he was sworn in on August 9, 1977. He worked his way up to the rank of detective in 1984 and was promoted to sergeant in 1986. In honor of Sergeant Littlefield’s law enforcement service and to remember his life and dedication to his job, a memorial was held on Friday, September 19, 1986, at the Mark B. Shaw Baseline Chapel in San Bernardino. Mass was held the next day on Saturday at Saint Adelaide’s Catholic Church in San Bernardino.